Since it was my first winter in retirement, I decided to escape the blustery cold, ice, and snow in Albany, NY and winter in Mt. Pleasant - a suburb of Charleston, SC. Charleston is a charming historical city and Mt. Pleasant is a wonderful town with beautiful beaches nearby, BUT there was no pickleball. Since I couldn't survive without pickleball for four months, I immediately contacted the USAPA South Carolina ambassador Jim Hisman, who heads up a vibrant pickleball club at the Del Webb Cane Bay community about 40 minutes north of Charleston in Summerville, SC. To my delight I found out that Jim had been in touch with the Mt. Pleasant Senior Center and had already scheduled a pickleball demo clinic for March 3rd. Over 40 people attended this first demo clinic. Jim, two other Cane Bay players, and I explained how to play pickleball by having a demo game, discussing rules, court position, and strategy. Then all 40 attendees got to try pickleball themselves. There were a lot of laughs, some great shots, and many immediate converts to the game we all love so much. Gary Jaster of the Mt. Pleasant Senior Center had scheduled more clinics and open play for the first and third Thursdays of each month until the end of April, and I volunteered to help run these clinics. I even took time out from my St Patrick's Day celebrations to run a clinic on that day - all decked out in green and white, as shown in the picture. What fun we had!! There is plenty of interest in Mt. Pleasant for growing pickleball, but the arrival of hot and muggy weather by the end of April made it clear we needed portable nets and an indoor (air conditioned) venue. A $250 grant from the USAPA allowed the Mt. Pleasant Senior Center to order two USAPA portable net systems, and Gary is looking for an indoor venue to become operational this Fall. One of the locals who attended the clinics, David Hirschhorn, is converting a cadre of highly skilled paddle tennis players to the game of pickleball in the interim. Another former upstate New Yorker, Emerson Horner, an experienced player from the Buffalo NY region who now lives in Mt. Pleasant, also helped at the clinics and became my trainer for the USAPA sanctioned Mid South tournament in Mandeville, LA where I, thanks to drilling with him and playing once in a while as a guest at Cane Bay, played well against nationally ranked competition. Gary Jaster of the Mt Pleasant Senior Center is an enthusiastic advocate for the game. I know that when I return in the Fall, we'll have indoor courts so we can continue to grow our pickleball community. The future of pickleball in Mt. Pleasant looks bright. 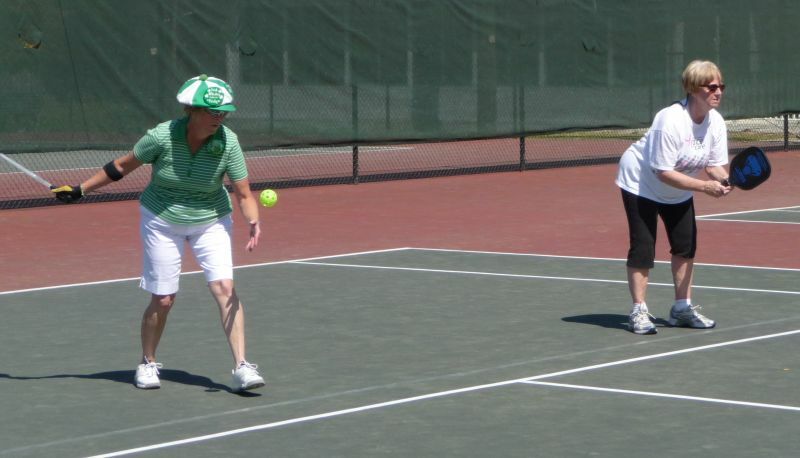 Soon we'll be able to host some local South Carolina tournaments with the Cane Bay and North Myrtle Beach pickleball clubs. Thanks to all who enabled me to play some pickleball while I wintered in South Carolina. I couldn't have survived without getting my pickleball fix satisfied.